Hello my lovely ladies! Today I have very special tutorial and I'm really excited to share with you that yesterday I made my first ever ombre nails! It started out as a joke but surprisingly it turned out really lovely so I decided to show you how I did it! It's really easy to make and because of the shades I chose it reminds me of sunset, which automatically puts me in great summer mood! <3 Hope you enjoy! 1. You will need: Two or three colors of nail polish, foundation sponge, scissors and a topcoat. 2. First, paint your nails white or a really pale pink shade. I chose to use Essie - Fiji because it is such a great quality and I know it won’t chip for days! Make sure you apply two coats because otherwise it could be a bit transparent and you won't get the same effect. Make sure you let your nails dry well before proceeding to the actual coloring! 3. While you wait the base color to completely dry, take a foundation sponge and cut it in down the size of your nails. Make sure that the surface is flat! 4. Then start applying a generous amount of each nail polish onto the sponge. You can use two or three shades depending on your preferences but I chose two because I really liked how these two shades compliment each other and felt like a third one will be too much. I used “I Pink I Can” by Sally Hansen and “Lemon Meringue” by Models Own. 5. Now for the fun part - start gently padding the sponge along your nail until you get the desired effect. Note that you'll need to reapply nail polish onto the sponge for every single nail otherwise the colors won't be as vibrant and opaque! 6. You will have nail polish around the cuticles no matter how precisely you do everything, so you'll need to clean that up. Just dip a Q-tip in a little bit of nail polish remover and carefully start getting rid of the excess. 7. When you are finished with that apply topcoat over the nails polish. This will help even out the surface, plus your nails will be beautifully shiny! :) I love using “Mega Shine” by Sally Hansen. Прекрасни са! :) Вдъхнови ме! Thats super pretty! I love it so much! So pretty and perfect for summer! This is such an amazing idea! I'm definitely going to be trying this! such a great idea! I've yet to try ombre nails actually! That is amazing, I am not always into nail art, but this is so pretty, well done! They're so lovely :) Totally trying this! I soooo want to try this out! Congratulations for your work! I really like the blog. Have a nice day. That looks really pretty, and perfect for spring! So going to give this a try! Nice post! Your nails look so pretty, and thanks for the comment on my blog will definitely check out your giveaway! I actually just created a Facebook page for my blog and accessories line Whimsical Wildfox! the result is adorable my dear! love the colours you chose... well well done!! So pretty! I love everything ombre! Wow - how fab! I never bother much with my nails but I do think this is worth a try for sure. 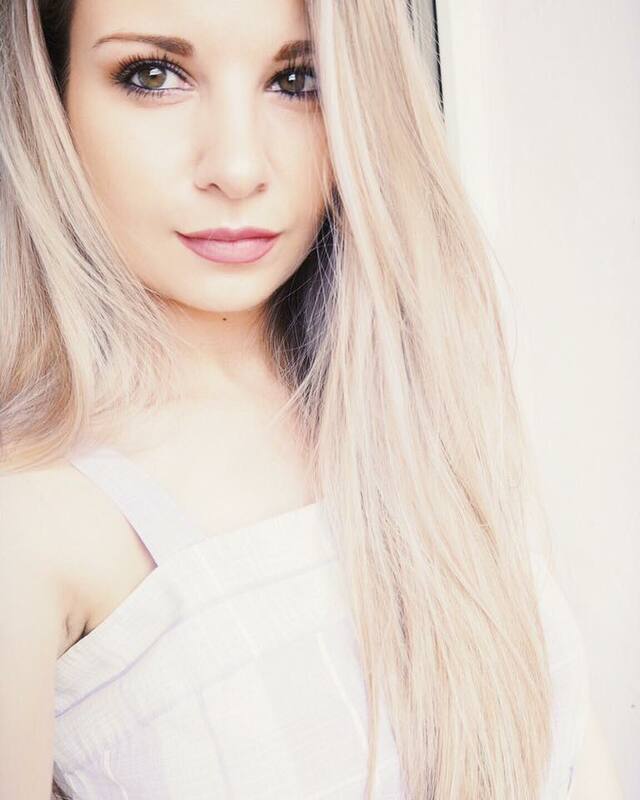 so stunning! great spring look! WOW, they look great.. definitely need to try this! Love the results you achieved with these pretty and unique ombre nails, looks so sweet! So pretty and summery! 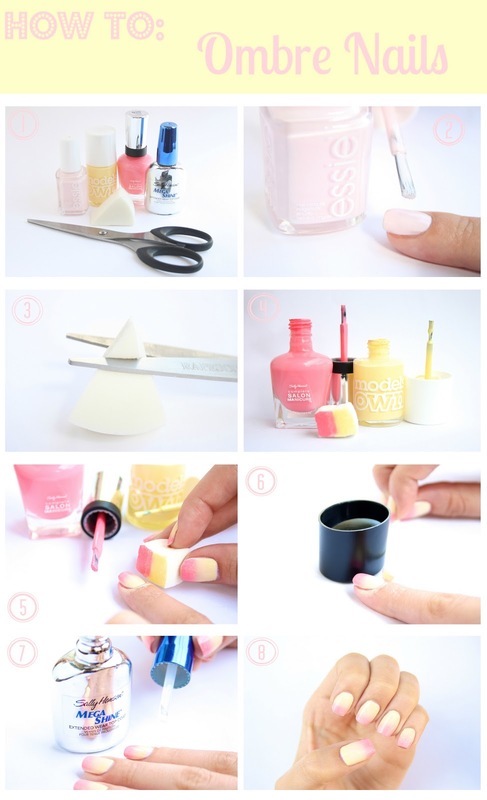 And what a great step by step picture tutorial! So easy to follow! This is such a good idea, thanks so much for the tutorial! You have a new follower :) Looking forward to reading more! Would love if you would have a look at my blog and follow back if you like it!! This is exactly what I need right now. I adore ombre nails but didnt know how to make it work. Looks great, will definitely give it a try. Thanks for your comment on my blog, maybe we can follow each other on bloglovin? LEt me know. This is soo cute! I will have to do this! Thank you for visiting my blog--I love this tutorial because it's something I can easily do on both hands. Usually, I'm really bad at painting the right hand, but with a sponge, it should be a breeze, right? Will DEFINITELY try this. Awesome, thankyou. So pretty! Idk why but i can never do a pretty ombre nails it always end up looking rough and un-ombre. Lol.